A few weeks ago the New York Times ran an excellent article about Vauben, a German town without cars. I meant to mention it then and was reminded to do so when The Independent ran an similar piece last week. Pretty cool! Read the articles for details, but the idea that so many families are attracted to a car free, and bike friendly, place is very encouraging. Update: In the comments Marc shared this study which I found very interesting. Tom and I almost always agree on the products VO should stock, but there are exceptions. When he saw these new grips made especially for Dia Compe inverse brake levers Tom just loved them. I wasn't so sure. He thought they looked sleek and the groove for the housing was a brilliant idea. I thought they looked too plain and would prefer a grip with more texture. But I trust Tom's judgment and so I placed an order. Of course that didn't stop me from kidding him about his "ugly grips". Well the grips finally arrived. The color is a close, though not exact, match for the lever bodies. The material is rubber-like and a little firmer than most grips, but not bad. And at $7.50 a pair the price is certainly right. On the down side, the rubber has an uneven sheen; it looks a little oily in spots. So what do you think? Was Tom right? Will they sell well? There's a six pack riding on this! 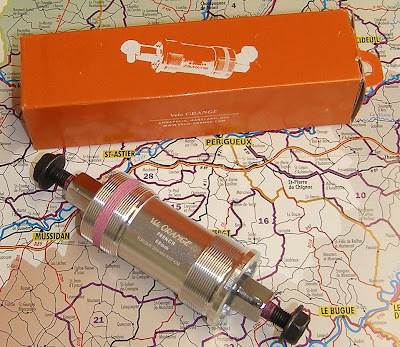 One other interesting item, a VO Grand Cru seat post just sold on E-Bay for $57. They are only $45 new! Here's the link to the auction. I guess we should raise prices? Nothing is ever certain when working with factories 8,000 miles away. Our last shipment is a good example. Two of the items I was most looking forward to didn't make the shipment. The new two-legged kickstands and the Dia Compe guidonnet levers were delayed. We buy from many factories that ship our products to our agent's warehouse, rather that directly to us, where it is consolidated into a single air or sea shipment. But production delays mean that some items don't make it by the ship date. Since both the kickstand and the levers are brand new, it's not surprising that there were delays in the very first production run. Our new anti-theft hub skewers did arrive. Unfortunately we incorrectly speced the length of the rear skewer (they only fit frames with 135mm rear spacing); just a simple mistake. But now we have to wait for replacement parts to make them fit other spacing. These use a special Allen wrench (it has a hole in the tip) that should deter most wheel thieves. 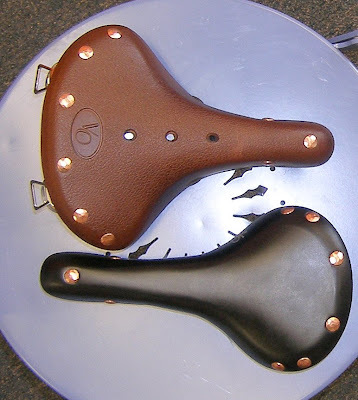 Our new saddles with the copper rivets are also delayed a few weeks. The factory missed a detail in our specs, the anti-stretch laminate on the underside. Again, just a simple mistake of the sort we all make. On the other hand, the new Dia Compe cable clips are perfect. These are great for restorations and for securing shift cables on internal hub conversions. And they are available in all three common steel tubing sizes, 25.4mm, 28.6mm, and 31.8mm. I thought I'd share a few interesting bits of news. We asked about getting the steel French thread headsets made and the factory wants a minimum order of 10,000 pieces. That won't do at all. It seems that steel headset production is very different from alloy and the minimums are much higher. So we will either have them made in alloy or have a CNC shop just make French threaded nuts, washers, and adjustable cups for a headset that's already in production, those being the only parts that differ on French headsets. There have been a few attempts at making square taper bottom brackets that don't use the threading on the frame. The advantage of this is that one BB will fit any frame, even Swiss, and they work on frames with damaged BB shells. But the only design that really worked well was the old Mavic version that required chamfering the BB shell and then used a pressure fit. Edco made a version that used a sort of cam mechanism, but was not as solid as the Mavic. More recently a Taiwanese company tried making a copy of the Mavic that didn't require modification of the shell; it was marginal at best and unsold stock can still be found in some catalogs. I recently saw a prototype BB in Taiwan that used a different mechanism. It looks to be far superior to any threadless BB made in the past. VO is angling to be the first US importer. While more expensive than a standard BB, these have the potential to save a lot of great old frames. 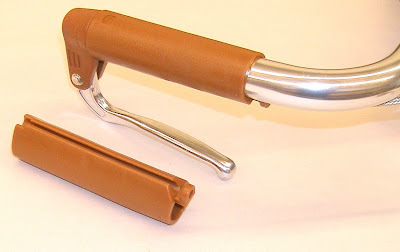 Special gum colored grips to match Dia Compe inverse levers with grooves for the brake cable. The factories seem to be catching up after the "spring rush" and we have another shipment from Taiwan and one from Japan arriving in mid-July with more cool new components. We have VO Porteur chain cases in stock again. These are still made in a two-man shop right down the street from VO world headquarters here in Annapolis. I admit that they are a pain to install and fine tune, but once in place they work great and they are an almost exact replica of the cases used by Parisian porteurs. One project that we've been neglecting is VO drop bars. We've asked several factories for drawings of discontinued drop bars in hopes of reviving a cool old design. It's always simpler and cheaper to use existing tooling, but nothing inspiring has surfaced. So we are starting from scratch on two designs. One will be a medium drop/reach touring bar with longish flats. The other will be a VO version of the classic Rando bar. Any suggestions? VO Bar Tape, What Colors? Tom has worked for months to find a mill in the US that can make cotton handlebar tape. Once he found one we went through a series of prototypes to get the weight, weave, and adhesive just right. Now, after dozens of prototype rolls, we're ready to start having it made. Here are some details. It's USA made exclusively for VO. The rolls are 10-feet long. That's longer than is standard so you can get a closer wrap or use it on mustache bars. The weight is just a touch heavier than Tressostar tape. Cost per roll will be about the same as Tressostar tape. The three easy colors that we'll definitely order are black, white, and natural or un-dyed (a light tan) since those are dye colors the mill always has on hand. We can any have any other color made; all that's required is the Pantone code for the color we want. But it will take six months to bring the color on-line and the minimum orders are substantial. So the big question is what colors should we have made. I only want to start with just a few to see how this goes. It makes no sense to replicate Tressostar colors; only new colors will do. We've been thinking of light blue, dark green, and gold, but we're more than happy to consider suggestions. What colors would you like to see? Also, fixed gear wheel sets are back in stock. Shimano 105/CR-18 wheels should be back late next week. And we will have a new Strumey Archer 3-speed/CR-18 rear wheel soon. I thought some of you might be interested in a few new VO projects. I wrote about the VO saddle bag support a few days ago and we're now waiting for samples of seat post mounts to use with the rails. 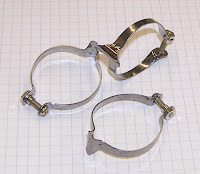 We are also looking for a factory to make VO clamp-on saddle bag loops. These may be made in the USA. By fall you'll be seeing VO saddles with hand-set copper rivets, just like those British guys use. A new VO saddle is also in the works. This one will be a medium width touring saddle to compete with the B-17. It may also be available in a sprung version. After long, and probably unnecessary, delays due to packaging design issues, we are ordering VO brake and shifter cable and housing kits in silver braid, black, white, blue, and red. Other colors are possible in the future. Each kit will contain a bike's worth of cables. housing, ferrules, and end caps. VO cotton USA-made handle bar tape is on the way, and in previously unavailable colors. I'll write more in a separate post. I've decided to proceed with a VO French headset if tooling is affordable, but a few key questions remain. I'm considering using a loose ball design rather than sealed bearings to keep costs down. And this headset might be chromed steel rather than alloy since that would allow a slightly lower stack height which is important when replacing old headsets. The chrome might also fit better with the styling of many classic French bikes. Nothing is decided yet so I thought I'd run it up the proverbial flagpole and see who salutes. Anybody? The long awaited French threaded bottom brackets have just arrived. That means that you can finally restore that Singer, Reyhand, or Goeland that's been collecting dust in your garden shed. Or look for an inexpensive Peugeot, Gitane, or Urago to turn into a budget randonneuse. In the past you were limited to very expensive Phil Wood BBs or searching E-bay for old stock, now we have the full range of sizes. Grand Cru bottom brackets have oversize sealed bearings and boron steel hollow axles. The cups are alloy. They includes axle bolts, and weigh about 258gm in 110mm. The taper is JIS. They are available in 103mm, 107mm, 110mm, 113mm, 116mm, and 122mm. Most Motobecanes use Swiss, not French BBs, but some top of the line and later models used French. You can tell by checking the direction of the threading. A French BB has right hand thread on both sides. With Swiss it's left hand on one side. If you want to reuse your old crank remember that it may be ISO taper, especially if it's an old TA or Stronglight or Campy. You can use a JIS BB, but the crank will sit 3-4mm further outboard; compensate with the BB spindle length you choose. Many old double cranks used 118mm BBs; I find 116mm JIS BBs to be a reasonable replacement. French headsets can still be found on E-bay and we may make some in the future. But if you replace the balls and grease regularly those old headsets will last a very long time. 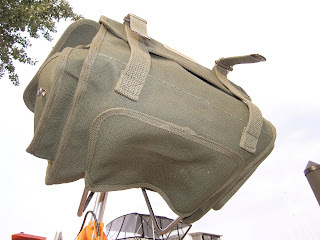 We have been selling the Viva Saddle bag support for a few years and, apart from one that broke, most everyone seems very satisfied with them. But I have the urge to make our own saddlebag support. I think we can improve on all the existing designs. It seems best to have a support that mounts to the seat post rather than the saddle rails or seat stays. This allows the support to slide up and down the post to accommodate various sized saddlebags. The seat post is also strong and is designed for this sort of load. I also would like to have a quick release version that uses a clamp that opens on a hinge and locks with a cam-type quick release. This is the system used on some of the seat post-mounted racks you see on mountain bikes. Some may be worried about a quick release clamp making the support easier to steal, but it's simple enough to replace the cam-lock with a machine screw. The remaining question is weight; is the extra weight of a hinge and cam worthwhile? Or would it be better to have it removable by loosening two Allen head bolts? It should be able to support about 15 pounds, which I think is about the max load most would carry. Of course a few folks will want to carry more weight in a saddle bag, but this support would not be for them. 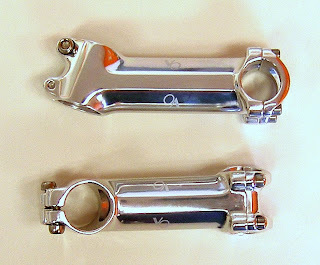 VO stems have just arrived and will be in stock shortly. This last production run took a few weeks longer than usual so we had ran out of most sizes. Now we have a full stock of sizes in the 6-degree stems. We also have all the 17-degree stems plus two new sizes, 70mm and 120mm. We'll be getting a shipment of Honjo fenders and other Japanese parts in a week or so. This will include the elusive spare fender hardware. Like many, I don't understand the fashion industry, which is not to say that I care nothing about fashion. It is a sort of visual art and a form of communication that can't be ignored. But the industry built around it seems so profoundly absurd as to be a parody of itself. 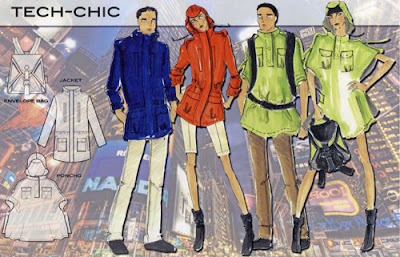 A fashion blog in the New York Times declares that one reason people don't bike to work is for lack of stylish biking clothes. Clearly what we need is LVMH Moët Hennessy • Louis Vuitton S.A. offering us Louis Vuitton handlebar bags and Gucci saddles and Tag Heuer cyclo-computers and Givenchy toe clip straps. Yes; those brands and dozens of others are all part of the LVMH luxury conglomerate. But I digress; the piece is actually about the “Bike in Style Challenge.” This is apparently a fashion show sponsored by LVMH and others that's geared toward bike wear. There is an audio slide show of the results here. I suppose it's good to see urban cycling receiving this sort of attention. On the other hand, it's also somehow disturbing to see the ludicrous branding and empty labels of the fashion industry slapped onto bike wear. The 12th annual Le Cirque du Cyclisme takes place this weekend in Leesburg Virginia. If you're interested in classic bikes there is nowhere you'll see a finer collection. In addition to the bike show and swap meet, there are various rides, and a few seminars and workshops. Leesburg is just south (I mean west !) of Washington DC and has lots of great country roads for riding. There is a historic downtown area with a few good restaurants, cafes, and bars. It's well worth the trip. I've attended the past few Cirques and have learned a lot each time. This year I have another event the same weekend and I'm not sure if there will be time for both, but I may try to make it out just for Sunday. Tom will be there with a bunch of VO samples and classic parts for the swap meet. Here is a page of photos from last year.